Alas, there are no immaculate matching perennial herbaceous borders here at Mooseys. My perennials are planted here, there, and everywhere - squashed in with flaxes and grasses and roses, used to fill space and provide summer and autumn colour. Pictures of famous English perennial borders have always tempted me, though I suspect that this style would not transplant well into my garden, with its resident New Zealand wind. All the photos look - well - windless! The first perennials I ever met were catmint and summer flowering phlox. I had no idea how they grew, and was amazed when (after cutting) the Nepeta regrew and flowered again. Now there are perennials all over my garden - and yes, I do have a row of catmint, and several patches of that original lilac phlox. I do have newer favourites, too. See if you like them! Bergenias impress me. They are almost (in my garden, at least), the perfect small perennial. They look good, with pretty flowers in spring, and beautiful green foliage with a touch of autumn red. They're easy to keep tidy - I grow mine in patches alongside paths. But is it a weed? Some plants are so finely balanced between being wonderfully desirable and downright weedy. The yellow Oenothera biennis, or common Evening Primrose, is one such for me. So is this easy-going biennial a potential pest? 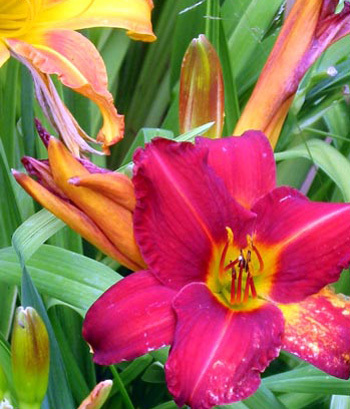 When I first started the garden here in the country I was given some huge clumps of species daylilies to plant. The terracotta colours of the first plants were very beautiful, but there seemed to be a lot of untidiness in the off season. This perennial cornflower has spiky blue flowers which look like paper cutouts. Their detail can only be seen close up. I cut them back after flowering and often am rewarded with more flowers in autumn. Aquilegias (Columbines) are enduring spring perennials, and a clear signal that the garden is on the move. As soon as they start flowering, I'd better be ready for action! They come in all colours and sizes, from small blues to large dusky pinks. One of my favourite perennials has been sadly missing from these pages until now. It's the humble pincushion flower, or blue Scabiosa, easy to grow, easy to keep tidy, and easy to turn rooted cuttings and pieces into new plants. Those quintessential country fence-line perennial clumpers, Kniphofias (Red Hot Pokers), have long been on my garden's 'Perhaps Not' list. Too coarse, too rudely orange perhaps? Well, well - I've finally seen the light. I always thought that Gazanias would enjoy flowering in my summer garden. There are enough hot spots at the edges of paths, where these pretty daisy-shaped flowers could open in the sun and be seen by a passer-by. When first given some Japanese Anemones I immediately planted them in a hot border by the house. It was quite the wrong place, but luckily for me the soil was desperately dry and I was able to dig out all the bits of roots. Back in the old days when I read gardening magazines and took notice of what they said, a must-have perennial kept popping up in the pages. It was a blue flowering Corydalis - and I still enjoy its appearance each spring. Barnhaven Primroses - the very name evokes all that is peaceful and pretty about the English countryside and English gardening. This spring I've bought some to provide much-needed colour in the house and patio garden. In my first perennial gardening phase I was inspired by photographs of well-watered English herbaceous borders. And so I fell hopelessly, romantically in love with the edging plant Alchemilla Mollis. My favourite early autumn yellow daisies are in fact perennial Rudbeckia, a relative of the popular annual daisies called Black-eyed Susan. The flowers have clear yellow petals and dark centres. The late summer perennial Aconite (or Aconitum) gets a pretty bad write-up in most gardening books. Of course, its sap is poisonous, and it has been used throughout the ages for what my book of garden perennials describes as 'deliberate poisoning'. Eeek! Hurray for mid-summer, and the perennial pink phloxes flowering brightly near the Pergola. I do so appreciate their rich pink shades. I'm less happy with the invasive lilac phloxes which seem to pop up everywhere. Who on earth planted them? Oops - me. I've always loved the ordinary yellow Verbascums I've seen in pictures of English gardens - like foxgloves, they make beautiful vertical accents. So when a rogue Verbascum 'arrived' on the edge of my water race, it was given a grand Moosey welcome. Catmint, or Nepeta, is a lovely perennial - scruffy, scented, much loved by cats and gardeners. It's easy to propagate and equally easy to rip out if you get sick of it. And if you remember to trim it back you'll get a second flowering. Phlomis is a beautiful perennial with subtle yellow flowers, useful for leaving uncut through winter - the stalks and seed-heads are quite sculptural. Several years ago I bought some Pulsatillas, commonly called Pasque Flowers, from a roadside stall. They were planted and promptly forgotten - until this spring. Salvias are a very varied and useful group of herbaceous perennials. Clary Sage, particularly the white variety, is one of my favourites. The colours of the bracts are subtle - creamy white and light green. Korean Angelica (Angelica gigas) is a stunning biennial which grows tall (about head high) in its second year and has large purple seed heads in summer. It's one of the best plants in my garden for accommodating both bumble bees and honey bees. Lupins are one of my favourite perennials, and these slate blue plants were grown from seed I gathered. They are happily flowering in Autumn from a Spring sowing. Sedums are fabulous perennials for any mixed border. The bees smother them in late summer, and during autumn the flower heads come into their own. I grow different varieties - some creamy white, some pink, and of course the famous 'Autumn Joy'. I also enjoy sedums with variegated foliage. I'm not an expert on the herbaceous geraniums growing in my garden. Many are all plants that I've picked out of mail-order catalogues, and forgotten their names soon after planting. I'm embarrassed that I've taken them so much for granted. There are so many Salvias which give joy and colour to any perennial planting scheme. One of my favourites is the blue spiked variety which I think is called Salvia superbum. Blue is such a great colour in the garden, and the bees love the Salvia flowers. Blue may be their favourite colour, as it is mine. Stachys byzantina, commonly known as Lambs Ears, is the ultimate edging foliage plant at Mooseys, and I grow two different types. My favourite is the lime green variety, which I know as Stachys limelight. I love my random patches of delphiniums (particularly when the wind isn't blowing). Some are seed grown, others were bought in from a fancy catalogue. My bees love them, too. I bought a purple Verbena through a mail order catalogue some years ago. Since then it has survived droughts, and frosts, and always flowers in full health in the later weeks of summer. Penstemons are so generous with their summer flowers and with their cutting-grown offspring. I have a number of regulars - Purple Passion, and Snowstorm, and a bright tomato red variety. My Liatris plant came from the local golf club plant sale. I've enjoyed its spikey flowers, and call it my punk pink flowering plant. It's planted in Middle Border by the edge of a dog-path, and I hope it bulks out there. This stylish perennial echinops grows well in the sunny rugosa rose border near the hen house. My foolish son wouldn't take any photos of it for weeks, thinking that it was a weed. Even though the flower heads are thistle-like, the foliage is not particularly nasty. I'm not much of a potted chrysanthemums person, though I did once load up the patio with bright yellow mums in bright blue glazed pots - as one does, when the local garden club makes a late autumn visit. Hee hee... In the real garden I grow only two Chrysanthemum varieties. Achillea often start as a gardener's favourite perennials and end up on the rubbish heap. They certainly die in a very scruffy way, and some visitors to my garden still see the most beautiful hybrids as weeds. Agastache was one of my early perennial seed purchases. I didn't know that it would be so generous in providing me with new seedlings, and dutifully collected my own seed after the first flowering season. I really needn't have bothered. I bought this Gypsophila from the local golf club and originally planted it in the Dog-Path Garden next to some small fire engine red roses. I''s such a good combination - the bridal veil white of the Gypsophila with the romance of the red roses underneath.